Comments On Jan 17, 2017:I recently purchased the red coral crushed stone. The color of the stone in the plastic bag appears to be a raspberry shade of pink. Do not be alarmed. As soon as the ca glue soaks in it turns as red as Rudolfs nose. It looks fantastic. Comments On Jan 01, 2015:So far I have purchased and used Bali Coral, Red Coral, Chrysocolla, Fuscite, and Green Malachite. The colors have been vibrant and really stood out on the cedar pieces I put them in. While all of the colors are great I think the Fuscite was the biggest surprise to me. After applying resin it dries to a rich, deep, dark green color and really stands out. For smaller crevices the crushed stone was easy to crush further into powder when necessary. I highly recommend this crushed stone to anyone. Comments On Jan 02, 2015:I bought several types of crushed stone. turquoise stones very convenient for processing and have a nice finish. I ordered twice and note shipment arrived very fast and the service excellent. 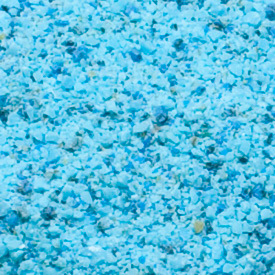 Comments On Sep 24, 2014:I have bought the Blue Lapis and Turquoise crushed stone and they both work great. The turquoise was a finer crush than the Lapis so I had to crush the lapis a little bit more for the smaller cracks. These crushed stones look great in any and all of my piece that I have used them in. Comments On Oct 29, 2013:I bought some Turquois crushed stone from CSUSA to use in repairs to voids/repairs for my penturning needs. I needed to crush it up into smaller pieces in order to use it in very small voids and it worked great mixed with either CA or Epoxy. The turquoise crushed stone really adds to the looks of sometimes a very plain looking pen blank. The color is very prominent and I would recommend the crushed stones from CSUSA to anyone who needs to add some extra color to your pen blanks and to repair small voids. This product works great and well worth the effort to add beauty to your pen blanks, bottle stoppers, wood bowls or any of your woodturning projects. Comments On May 05, 2013:I purchased the Jet Black Crushed Stone to fill a few cracks in a project using Hot Stuff Special T Instant CA glue. The product worked fine for my application but I observed a chemical reaction between the stone (which I had ground to a powder) and the glue about 1-2 min. after mixing. It produced a little smoke but worst of all, it completely hardened before I was able to use the entire mixture. Mixing smaller batches allowed time to apply it to the cracks before it hardened.